One of the best advanced sewing machines from Brother. It has all the versatility and quality you could wish for. The price is affordable as well. 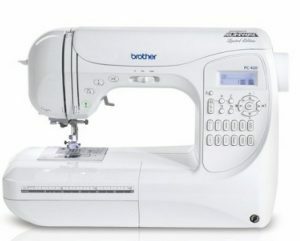 Brother PC-420 PRW is a fully computerized sewing machine. It is a sewing machine designed for advanced users. This machine comes with 129 built-in stitches, that is a lot. It has all the kind of stitches you are looking for. It comes with 25 year limited warranty. You can control stitching speed from high to low using the slider provided. You go fast if you are an advanced user or you can switch back to slow stitching if you don’t feel comfortable or you can choose a speed somewhere in between. It has a reverse stitching button to lock your stitches. There is a needle down button as well. The threading system on Brother PC-420 PRW is absolutely great. Threading is as simple as it could ever get. The automatic needle threader is another great feature. It comes with a foot pedal, but you may not require it in most cases. One great feature of Brother PC-420 PRW is the automatic thread cutter. I haven’t seen this feature on many machines. There is a button with scissor icon on it, when you press on it, the machine automatically cuts the thread for you. This sewing machine is pretty light weight as well. You can easily pick it up using the carrying handle. Another wonderful feature of Brother PC-420 PRW is the option to combine stitch patterns. In addition to the 294 built-in stitches, you can make your own patterns using the combine patterns option. You can create your own custom stitch and save it in the memory. The LCD display lets you keep an eye on the stitch length, width etc. It has a stitching speed of 850 stitches/min. The user manual is easy to read and understand. Brother PC-420 PRW is a very quiet machine. The stitch speed control is a cool feature. You can go really slow if you want to. The top drop-in bobbin makes things pretty easy. The start/stop button gives you great control when you are using the machine without the foot pedal. There is an error ‘beep’ alarm when things are not set right. It is a great feature. All Brother PC-420 PRW accessories can be nicely stored in the storage compartment provided at the base of the sewing machine. It comes with quite a lot of accessories. Stitches come out straight and perfect on this machine. It did a perfect job with multiple layers of denim. Brother PC-420 PRW does not do embroidery. Brother could have included embroidery feature as well. The LED work light could have been brighter. Overall, Brother PC-420 PRW is an all round, well built, feature packed, quality machine. This sewing works equally well on thick and thin fabrics.If any machine made me say wow!, this is the one. The price is slightly on the higher side though.